The partnership between the NOAA Office of Ocean Exploration and Research and the Ocean Exploration Trust has been an evolving one, tracing its roots back to 2000. Image courtesy of the Ocean Exploration Trust. Download image (jpg, 65 KB). 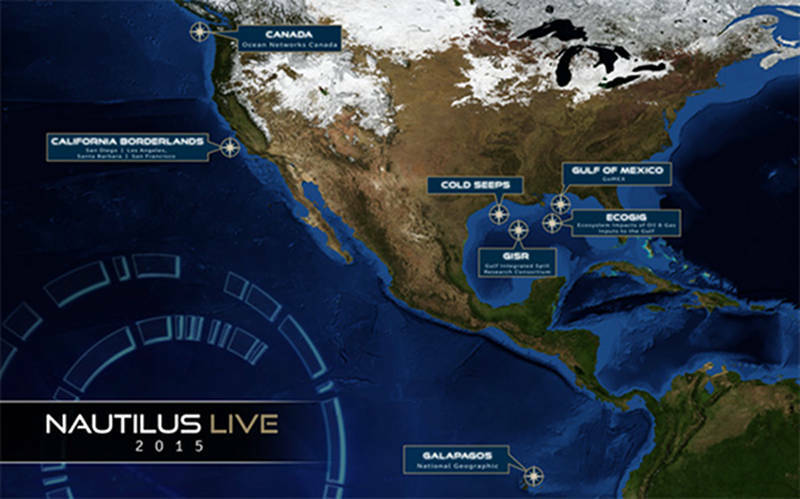 From April through September 2015, Exploration Vessel Nautilus explored sites ranging from the Gulf of Mexico to British Columbia. The season marks the transition of the vessel and operations of the Ocean Exploration Trust to the west coast of the United States and the Pacific Ocean, concluding over two years of research in the Gulf and Caribbean regions. The NOAA Office of Ocean Exploration and Research provides support for the complementary ocean exploration program of the Ocean Exploration Trust’s E/V Nautilus, which operates with similar tools, technology and operating profile as that of NOAA Ship Okeanos Explorer. By collaborating on mission plans, these partners are helping increase understanding of our largely unknown ocean, illustrate the value and importance of ocean exploration, and develop the next generation of ocean explorers. Throughout the Nautilus field season, telepresence technology will allow you to follow discoveries and interact with scientists live via the nautiluslive.org website , putting the unexplored ocean directly into your hands. Follow the LIVE seafloor video and send in your questions to scientists on board on nautiluslive.org . 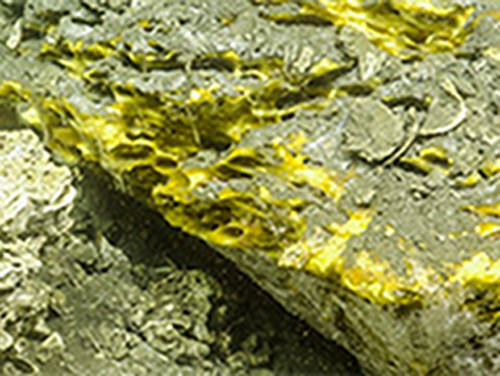 That's not gold, it's solid methane at the Sleeping Dragon seep. Methane can be found as a solid due the intense pressure found at these depths. Image courtesy of the Ocean Exploration Trust. Download image (jpg, 49 KB). During this leg in the Gulf of Mexico, scientists sought to understand what impact natural hydrocarbon seeps have on the ocean and atmosphere. While on site, scientists acoustically and visually mapped bubble/droplet plumes through the water column. Information collected will be used to develop a multi-scale modeling system to track the pathways of transforming hydrocarbons released from deep-oil seeps in the oceans. This expedition is part of the Gulf Integrated Spill Response Consortium, funded by the Gulf of Mexico Research Initiative. View video of Hercules' encounter with a sperm whale. Lophelia coral and squat lobster imaged during the ECOGIG expedition. Image courtesy of the Ocean Exploration Trust. Download image (jpg, 44 KB). On this cruise, researchers from the Ecosystem Impacts of Oil and Gas Inputs to the Gulf (ECOGIG) group examined deep-sea corals, their associated communities, and their response to the 2010 Deepwater Horizon oil spill by re-imaging as many as possible of the same corals that they have been following over the last four years. They also collected corals for laboratory experiments and for analyses of coral and microbe response to natural oil seepage. The 2015 ECOGIG cruise is a continuation of a three-year partnership with the Ocean Exploration Trust to study the ecosystem-level response to oil and gas in the Gulf of Mexico. View video from this mission. Chemosynthetic mussels at site visited during mission. Image courtesy of the Ocean Exploration Trust. Download image (jpg, 32 KB). 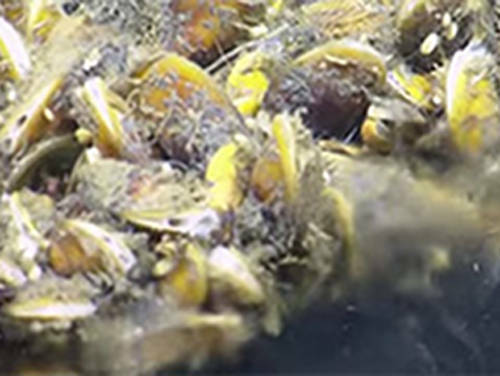 On this leg of the expedition, scientists returned to cold methane seeps and brine pools in the Gulf of Mexico investigated during the 2014 season, to continue an examination of the symbiosis between the mussels that live at the seeps and the bacterial symbionts that they host. They collected mussels and surrounding water and sediments and will characterize the microbial populations in each using next-generation sequencing technologies. Watch a video summary from this mission. During this leg, the team encountered a spectacular brine pool and collected mussel samples from the area. Image courtesy of the Ocean Exploration Trust. Download image (jpg, 32 KB). This cruise continues Nautilus’ exploration throughout the Gulf of Mexico region, investigating biologic, geologic, and archaeological sites. We explored and characterized a variety of seafloor habitats across upper slope, mid-slope, and lower-slope depths, including hard substrate coral habitats, hydrocarbon seeps, and brine pools. The overarching goal of the cruise was the exploration of biological communities and associated geochemical and isotopic records of carbon cycling using a cutting-edge in situ laser spectrometer platform integrated with the remotely operated vehicle Hercules. View photos of a brine lake visited during the expedition. 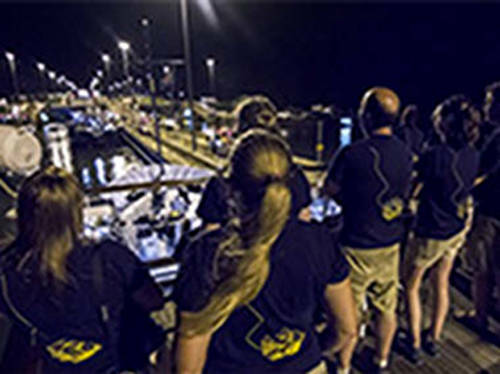 The team aboard Nautilus stands on the upper deck in anticipation of first set of locks upon entering the Panama Canal. Image courtesy of the Ocean Exploration Trust. Download image (jpg, 34 KB). E/V Nautilus transited from Galveston, Texas, to Panama and then crossed through the Panama Canal, signaling the entry of Nautilus to its future work in the East Pacific region. After crossing the Panama Canal, the E/V Nautilus transited to the Galapagos Islands. This transit included a mapping survey at the site in the Galapagos Rift where hydrothermal vents and chemosynthetic organisms were first discovered. Data collected by the Nautilus will be compared to data collected by the U.S. Navy in 1976 and by NOAA Ship Okeanos Explorer in 2011 to see what changes have occurred at the site. View more photos of the canal crossing. View data collected during the transit to Balboa, Panama. View data collected during the transit to Baltra, Galapagos. 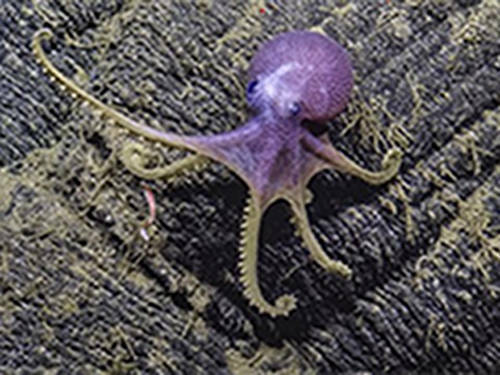 During Nautilus explorations of the hydrothermal vents near the Galapagos Islands, the deep-sea octopus, Graneledone boreopacifica, was spotted several times on the ocean floor, clinging to rock ledges. Image courtesy of the Ocean Exploration Trust. Download image (jpg, 34 KB). The E/V Nautilus spent several weeks exploring the Galapagos Rift region. The main objectives of this leg were to explore the biological diversity and geological structure of the foundation of the Galapagos Islands and the adjacent deep-sea spreading center to the north. 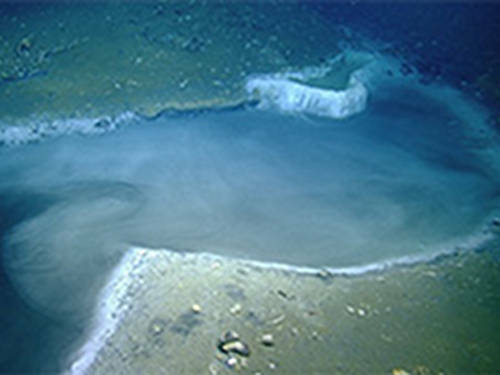 Scientists also revisited the site where hydrothermal vents and chemosynthetic organisms were first discovered, as well as other vent sites. View photos of the geology seen during the expedition. View data collected during this expedition here, here, and here. For this leg of the expedition, the E/V Nautilus will transit from Baltra to an area 1,000 nautical miles west of Colima, Mexico, to international waters, where there are two sites of interest for seafloor mapping. E/V Nautilus will survey each site using multibeam sonar and create a higher-resolution map than what is currently available based on satellite altimetry sensors. 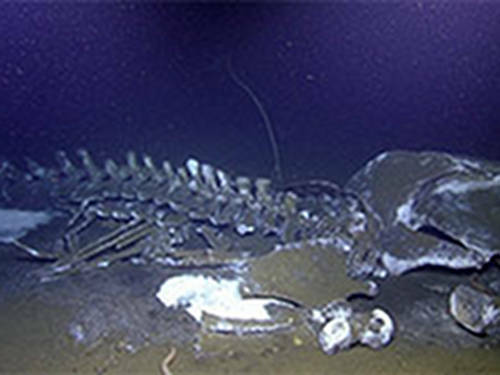 A whale carcass in the deep ocean is a source of of food and topography that supports life years after we whale's death. Diving at the Rosebud whale fall site off the coast of San Diego, the team of E/V Nautilus visually surveyed the area and collected samples to better understand the lifespan of a whale fall. Image courtesy of the Ocean Exploration Trust. Download image (jpg, 34 KB). This cruise will explore the ocean floor in previously unstudied portions of the California Borderlands, offshore from some of the most tectonically active (as well as densely populated) areas of California, using a combination of high resolution multibeam mapping, sonar surveys, and targeted remotely operated vehicle dives. Nautilus will visit known and possible cold seeps off San Diego and Santa Monica associated with gas hydrate dissociation and methane seepage. The team will also examine a three-year-old fin whale carcass to examine the changes that occur over one year to a “whale fall.” The final day of the expedition will involve exploration and high-resolution mapping operations at the wreck site of USS Macon within Monterey Bay National Marine Sanctuary. View photos of the whale fall seen during the expedition. View data collected during this expedition here and here. A whale carcass in the deep ocean is a source of of food and topography that supports life years after we whale's death. Diving at the Rosebud whale fall site off the coast of San Diego, the team of E/V Nautilus visually surveyed the area and collected samples to better understand the lifespan of a whale fall. Image courtesy of the Ocean Exploration Trust. Download image (jpg, 25 KB). 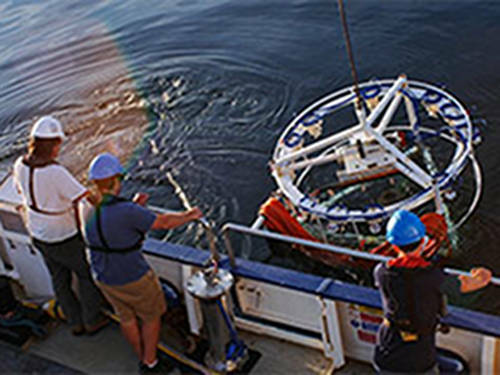 The E/V Nautilus will transit up the west coast of the United States to the North East Pacific Time-series Underwater Networked Experiments (NEPTUNE) under-sea observatory located off the west coast of Vancouver Island, British Columbia. The observatory’s infrastructure enables scientists to study phenomena through continuous long-term, high-temporal resolution observations not afforded by traditional ship-based ocean exploration. The Nautilus will conduct dual-ship operations with other vessels and use the remotely operated vehicles to assist Ocean Networks Canada in maintenance of the observatory. View additional photos from the expedition. 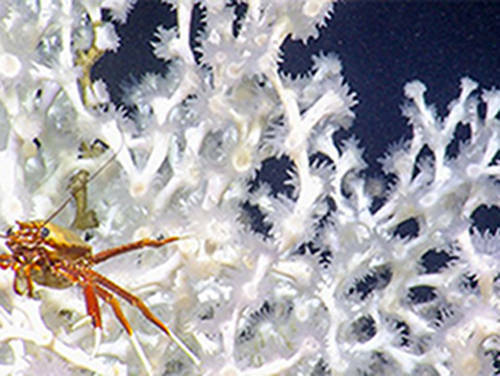 The partnership between the NOAA Office of Ocean Exploration and Research and the Ocean Exploration Trust has been an evolving one, tracing its roots back to 2000. NOAA Ship Okeanos Explorer was developed alongside E/V Nautilus , allowing the sharing of telepresence technology to bring the wonder of ocean exploration from ship to shore. In addition to providing funding support for the Nautilus mission, the Office of Ocean Exploration and Research continues to work with the Ocean Exploration Trust to advance technology and reduce uncertainties in critical parts of our largely unexplored deep ocean.